Kunstkloake - ZineWiki - the history and culture of zines, independent media and the small press. The pupil's magazine KunstKloake (Art-Sewer) was created by a group of pupils from Dinslaken, Germany. It was produced in a workshop hosted by Patrick Rieve at the Freie Waldorfschule, Dinslaken-Eppinghoven. The creative process spilled over and other schools were involved. The newspaper was puplished in June 2013. 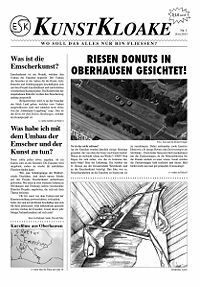 On 24 pages (newspaper format), the publication assembles reports, fiction, poetry and comics (Fluffy Zuckerwatte), fotos, drawings and random stuff by an incredible large group of pupils from three different schools in Dinslaken, Duisburg and Oberhausen (the Ruhr Area). All articles are written in German language. The newsprint publication was created on the occasion of the exhibition EMSCHERKUNST 2013 and is included in the collection of the St. Patrick's Zine Library. This page was last modified on 18 June 2014, at 03:56.